Q:Hi could you not order a mixture of these such as 50 bride and 50 groom and get the cheaper price per ton and shopping? A:Each item must be ordered individually, and the minimum order quantity for each tin is 6. 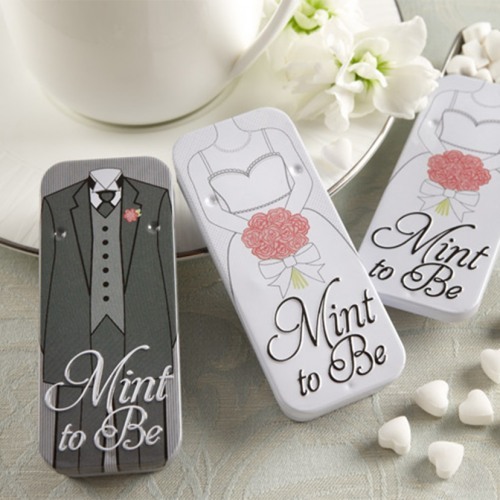 For the couple with a sense of humor, these punny mint to be bride and groom mint tins make such a fin wedding favor. Each tin easily slides open to reveal dozens of tasty heart-shaped mints and is adorned with one of two designs. The bride mint tin features a white cover and the illusion of a bride holding beautiful pink flowers. The groom tin features a gray background in formal attire and a pink boutonniere. Simply hand these out to wedding guests at the end of the night for a refreshingly fun thank you!